There is one gemstone that always conjures up the spirit of summer for me. You guessed it, it's turquoise. 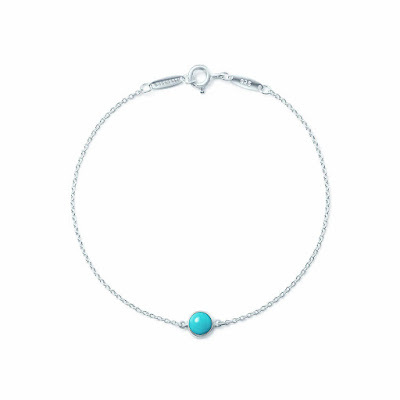 Despite it being the birthstone for December, summer has always had a strong bond with the gemstone turquoise. Maybe it the fact that the colours of this stone resonate with the waves of the ocean, shimmer of a swimming pool or that perfect clear blue sky you get when you're on holiday. 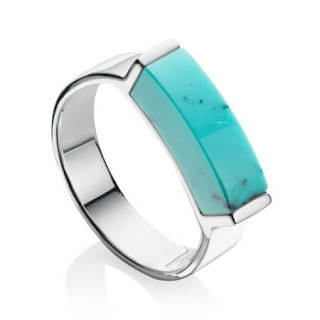 One of the great things about turquoise is that I see it used with silver as much as I do yellow gold. The bright stone lends itself well to the cool clean tones of silver and the warmer tones of yellow. As someone who only wears yellow and rose coloured golds I always have a little bit of a bias towards these metal colours. However many designers are often willing to work with all colours of metal when crafting with this stone. Lots of designers have been using Turquoise as it's so bright and opaque that the stones can often look bigger and make a bigger impact than a clear stone. Previous fashion have been for turquoise cut as a cabochon or a bead but I'm definitely seeing more faceted pieces available. Turquoise has never really gone out of fashion and is likely to be one of the oldest gemstones in history. It was often seen as symbol of wealth and protection in many cultures and in modern days as a symbol for happiness. This seems quite fitting as happiness is often what we're seeking when on holiday. Speaking of exotic destinations turquoise is often found in Iran, Tibet, Africa, Afghanistan and Australia. So if you are visiting one of these countries perhaps think about buying some turquoise on your journey as a memento. Be careful when buying turquoise as replicas are often used in costume jewellery and you might end up with something not genuine. Be sure to always ask and check product descriptions when buying this very popular stone. Often smooth and flawless stones are more likely to not be real where as stone with lines, veins and other mineral deposits is more likely to be real. 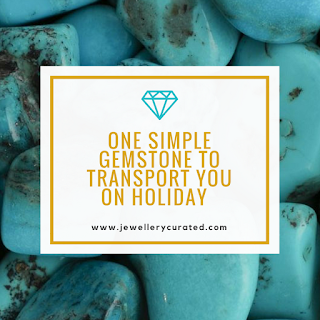 When it comes to choosing a piece to wear I would prefer to go for a statement piece with one massive turquoise stone for a bold and bright look. Having said that I also have a pair of turquoise stud earrings which I live in when on holiday. 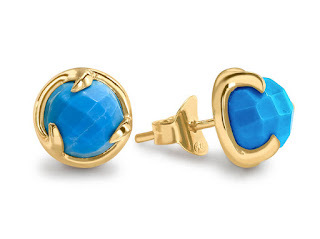 Nothing looks more coordinated when swimming in a turquoise pool and having also having matching earrings. 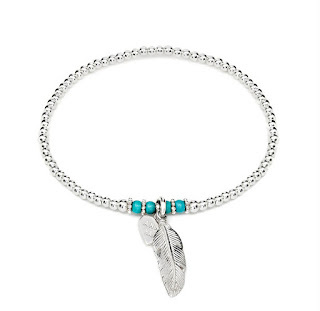 This bracelet is really cute and simple and the epitome of grown up friendship bracelets. 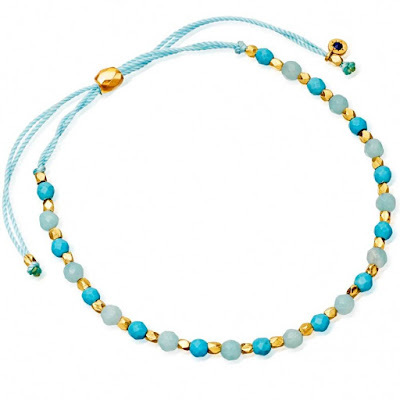 The turquoise beads are interspersed with amazonite and gold plated sterling silver nuggets. As it's adjustable this is a great piece to take on holiday as it's very easy to wear and the beads would be comfortable. A simple, sleek design featuring a round bezel set gemstone. 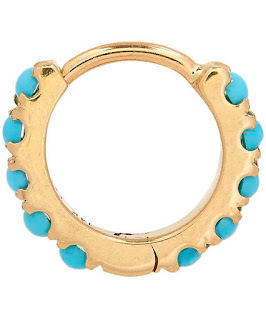 This bright and vibrant circle ring will add a bold finish to a day or evening look worn alone or paired with other geometric styles. 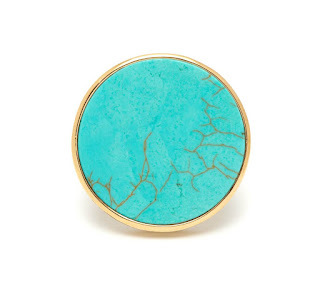 This stone is Turquoise Magnesite and features a stunning cracked effect on the stone. Sometimes turquoise can look very bohemian and not always so elegant. Not this piece, it's almost smartie like turquoise cabechon gemstone gives a wonderful pop of colour without over whelming the wearer. If you're on holiday and looking for something understated and cool that you can effortlessly wear back at home. A stand out piece that's perfect for someone looking for something that's a perfect balance of chic and bohemian. The stone is natural turquoise and fits snuggly around the cartilage on your ear. Mix and match this stunning earring with simple plain hoops for an interesting layered look. Lola Rose is the go to place to buy affordable gemstone jewellery. You'll get plenty of turquoise for your buck with this necklace. 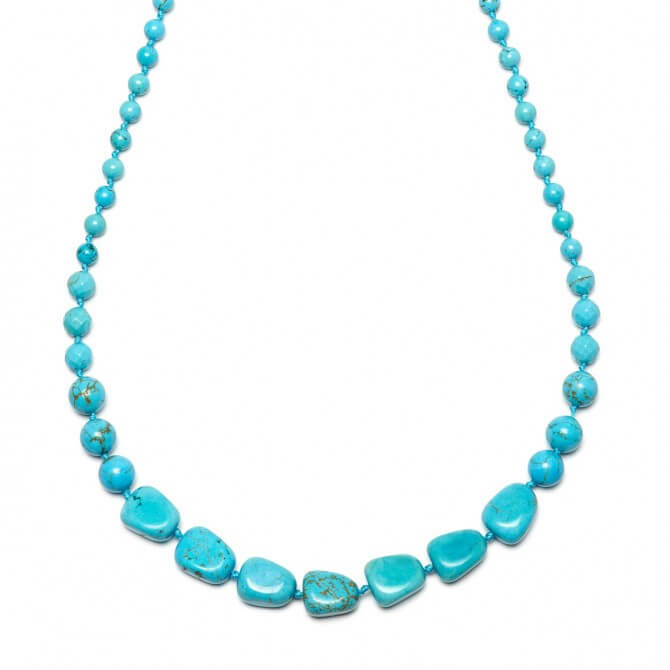 It's a surprisingly long necklace and as the stones get bigger you'll notice they get more detailed with natural markings that you see on classic turquoise. Wear with a simple dress to keep the focus on this summery and bright necklace. These are the studs that I mentioned earlier. Whenever I go on holiday I pop these on before heading off to the airport and they don't come off till I'm back at my flat. I have quite different jewellery taste when I'm on holiday compared to when I'm at home. I wear these earrings in Lapis Lazuli and Labradorite when I'm at home just in case you weren't sure just how much I love them. 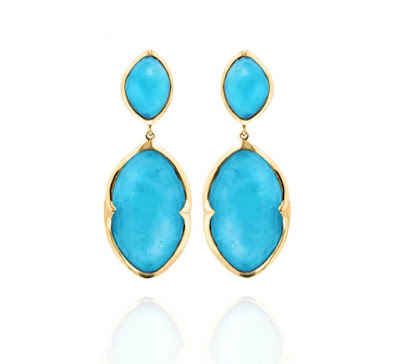 The turquoise is very opaque on these earrings but nothing look better than matching your earrings to the ocean or the swimming pool. The Monica Vinader linear collection is one of my absolute favourites. The use of opaque gemstones gives each piece such a vibrant look. The open setting gives the illusion of a floating stone. As the colour and translucency is different for every piece each piece becomes entirely unique. I also think this collection lends itself beautifully to silver and yellow gold. 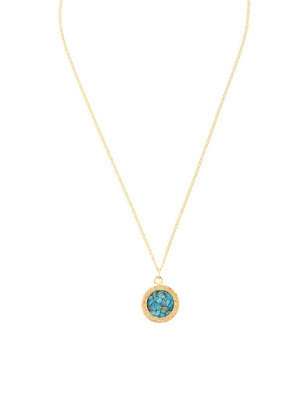 I love a shaker pendant and this gorgeous pendant looks so chic and natural at the same time with the small turquoise stones in the pendant. 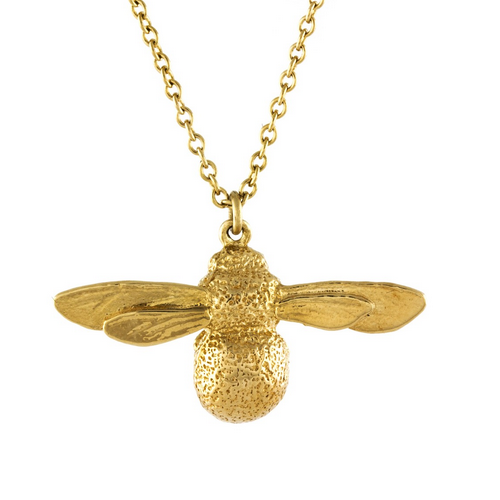 This necklace is made of 22 carat gold plated sterling silver and comes on a long or a short chain. This is from Rachel Jackson's Amulet collection and you can choose up to four birthstones to personalise your necklace with. Wear this on it's own or layered with other necklaces for that bohemian beach look. These large statement earrings use an amazing technique of fusing a flat turquoise with a quartz crystal to give that faceted and shimmering look. The overall effect causes a ripple on the turquoise which looks exactly like a swimming pool. These are also a great pair of earrings for an evening do as they are fairly big and the colour is so beautiful. Perhaps you off to a festival this summer instead of the beach? This is a great piece to wear with the Annie Haak charm almost looking like a guitar pick. The silver beads are hand threaded and give a pretty boho vibe. The turquoise beads are turquoise dyed magnesite and have a lovely cracked effect. These gorgeous hand strung beaded earrings are sure to make a statement as they swish whilst you walk to the pool. Some people like to get something new every summer or perhaps buy something whilst on holiday. 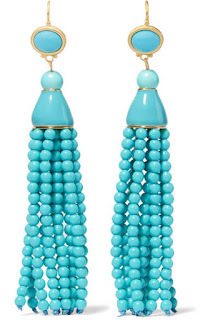 However these tassel earrings are the perfect long term investment piece to get as you can wear them easily ever summer and they wont go out of fashion. 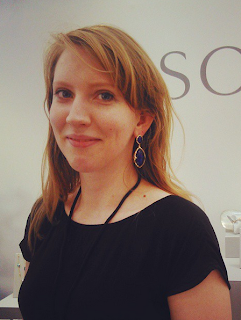 Oliver Bonas is with out a doubt one of the best places to buy jewellery on the high street. 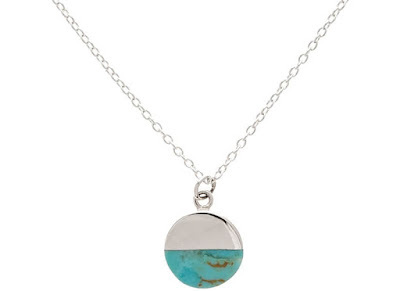 This necklace is only £28.00 and it's made of sterling silver and with real turquoise. Each one will look unique with the markings of the turquoise stone. Have you been following the Jewellery Curated Summer Holiday? This month I'm posting every other day about the most elegant jewellery to take on holiday, how to be a mermaid and statement holiday earrings.